A funny thing happened today. B opened up his personal site, which hasn’t been touched in a while, and noticed he had gotten 423 new hits today. WHAT? It only took a few seconds for us to realize what had happened. 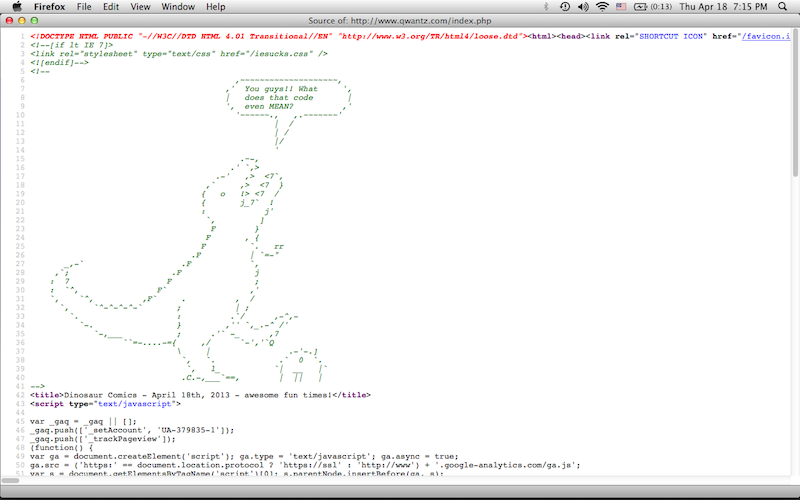 B recently was working on a web design project for one of his classes and included an “Easter Egg” in the source code. For those of you non-techies out there, that means he made a drawing within the code as a surprise for anyone looking at it. The drawing was of T-Rex from one of our all-time favorite web comics, Dinosaur Comics, by Ryan North. On a whim, B emailed the project to Ryan to show him what he had created. Ryan actually read the email and emailed B back asking if he could add the T-Rex drawing to the source code of qwantz.com, where Dinosaur Comics is hosted. B immediately agreed. If you are using Firefox, you can visit qwantz.com and press command + U (on a mac, ctrl + U on a PC) to view the source code. B is so honored to have a little piece of his work become part of the Dinosaur Comics site and I am so, so proud of him. So a warm welcome to any readers that may have ended up here through Dinosaur Comics. We are so glad to have you!